Try our Genuine Charoite Spheres Satisfaction Guarantee - compare our prices and our superior quality. Click on any natural charoite sphere or egg image below to enlarge it. This natural color charoite sphere was handcrafted with a fine quality finish from a single piece of natural color dark purple charoite rough that was mined in Russia. It also has black aegerine and gray orthoclase, and a couple of small crystals of the rare orange color mineral tinaksite. The photo at left was taken under incandescent light. This natural color charoite sphere was handcrafted with a fine quality finish from a single piece of natural color dark purple charoite rough that was mined in Russia. It also has black aegerine and gray orthoclase. This natural color charoite sphere was handcrafted with a fine quality finish from a single piece of natural color dark purple charoite rough that was mined in Russia. It also has black aegerine and orthoclase. see also an opposite side view of this natural color charoite Sphere. This natural color charoite sphere was handcrafted with a fine quality finish from a single piece of natural color dark purple charoite rough that was mined in Russia. It has a large expanse of pale gray-green orthoclase as shown with an "island" of beautiful chatoyant purple charoite in the middle. The opposite side is mostly very dark purple chatoyant charoite with some black aegerine and some pale gray-green orthoclase. See also an opposite side view of this natural color charoite Sphere. This natural color charoite sphere has lots of chatoyancy! 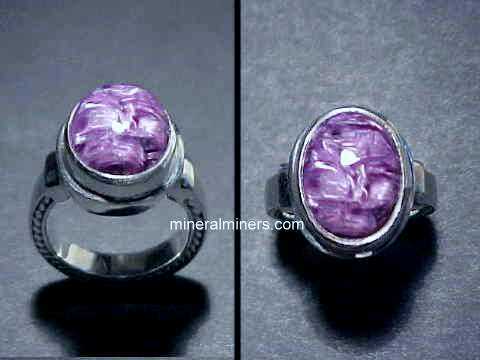 It was handcrafted with a fine quality finish from a single piece of natural color charoite rough that was mined in Russia. It also has black aegerine, orthoclase, and a large crystal of the rare orange color mineral tinaksite. This natural color charoite sphere was handcrafted with a fine quality finish from a single piece of natural color dark purple charoite rough that was mined in Russia. It also has black aegerine, orthoclase, and some crystals of the rare orange color mineral tinaksite. The photo at left was taken under incandescent light. This natural color charoite sphere has dark purple color and chatoyant areas. It was handcrafted with a fine quality finish from a single piece of natural color charoite rough that was mined in Russia. It also has black aegerine, orthoclase, and a crystals of the rare orange color mineral tinaksite. This natural color charoite sphere has dark purple color and chatoyant areas. It was handcrafted with a fine quality finish from a single piece of natural color charoite rough that was mined in Russia. It also has black aegerine, orthoclase, and a crystals of the rare orange color mineral tinaksite. There is an interesting spray pattern of large tinaksite crystals on the opposite side. 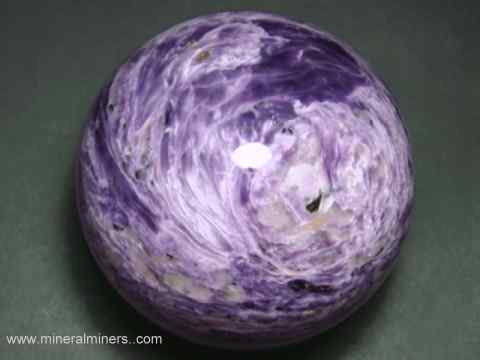 See an opposite side view of this natural color charoite Sphere. This natural color charoite sphere was handcrafted with a fine quality finish from a single piece of natural color charoite rough that was mined in Russia. It also has black aegerine, pale gray-green orthoclase, and crystals of the rare orange color mineral tinaksite. See also an opposite side view of this natural color charoite Sphere. This natural color charoite sphere was handcrafted with a fine quality finish from a single piece of natural color rich purple charoite rough that was mined in Russia. It also has black aegerine, orthoclase, and a large band of intergrown crystals of the rare orange color mineral tinaksite. The photo at left was taken under daylight. This natural color charoite sphere was handcrafted with a fine quality finish from a single piece of natural color charoite rough that was mined in Russia. It also has black aegerine, pale gray-green orthoclase, and crystals of the orange color mineral tinaksite. See also an opposite side view of this natural color charoite Sphere. This rare size charoite sphere was sawn, ground & polished from a large chunk of natural charoite rough that was mined in Russia. 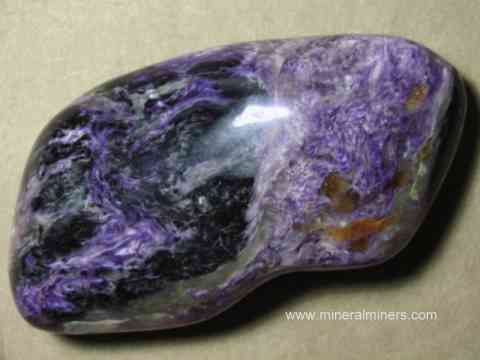 The dark purple charoite has a beautiful swirled look, with pale yellow orthoclase grains. There also are a few chatoyant crystals of the rare orange mineral tinaksite. See also an opposite side view of this natural color charoite Sphere. We also carry an assortment of stands for small & medium sized spheres. This is the end of our Charoite Spheres and Eggs virtual gallery page. Our Charoite spheres and eggs are all handcrafted from natural charoite rough that was mined in Siberia, Russia. 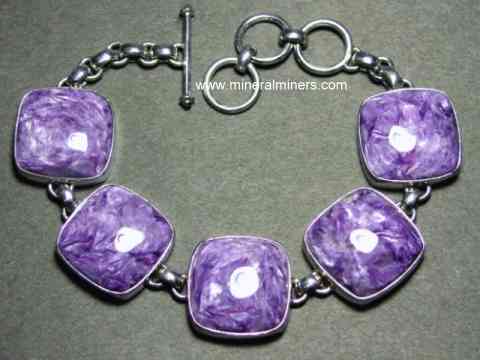 See also our page displaying Genuine Charoite Jewelry designs. 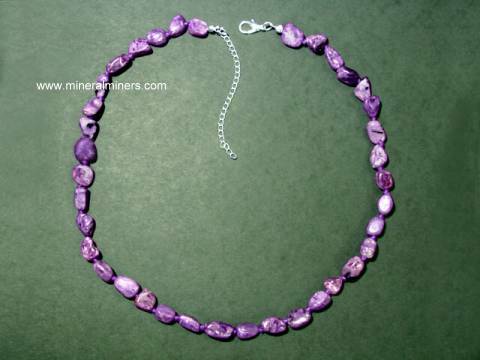 Our genuine charoite jewelry items are available in a wide variety of styles and designs in bracelets, rings and necklaces set in pure .925 sterling silver. We also have some other rare mineral spheres from Russia including eudialyte spheres from the Kola Peninsula, jade spheres and astrophylite spheres. 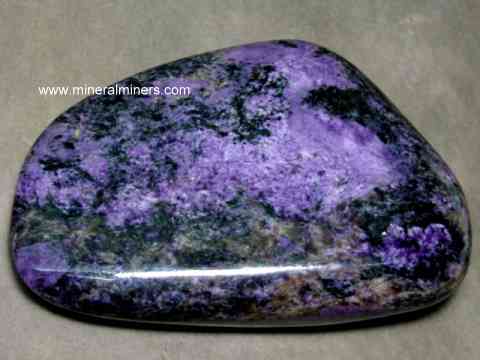 To see more Charoite photos, just select another item category from the table below. To see photos of another mineral variety, select any item category link in our Mineral Inventory & Factsheet Index. 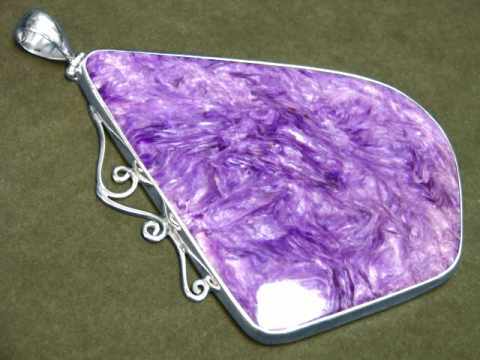 We have a large selection of genuine charoite products available - all with 100% natural color. 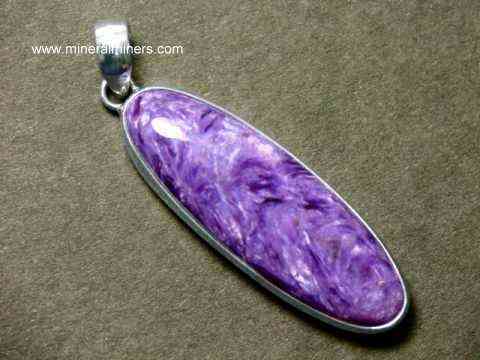 We specialize in Collector Quality Charoite! 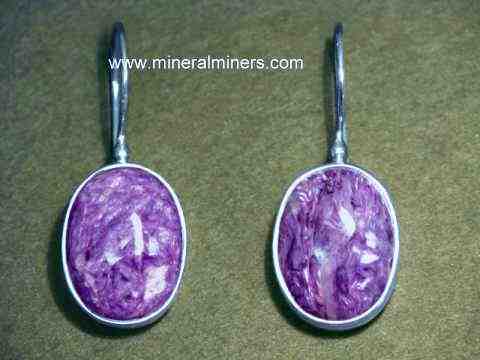 We specialize in natural color untreated charoite! 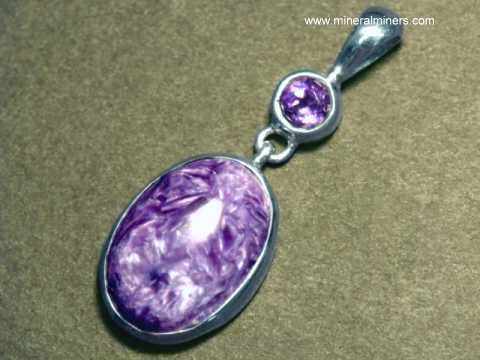 Would you like us to inform you when we add more natural charoite spheres and eggs on this page? We do have a additional charoite spheres and eggs in stock, so be sure to let us know if you have any charoite special requests. Please contact our webmaster or our 'site' geologist with any questions or comments.